Our Ladies Auxiliary will again hold their annual Garage Sale, this year on two days: Friday, April 12 (4-8pm) and Saturday, April 13 (10am-4pm). Everyone is invited to this fun event where you may find some “treasures” to take home. Don’t miss out on our large and diverse selection! A new feature added to this year’s event is “First-Pick” Friday. Come be the first to preview and purchase items the night before the general sale for just a $2 per person admission at the door. As always, admission is free all day Saturday. 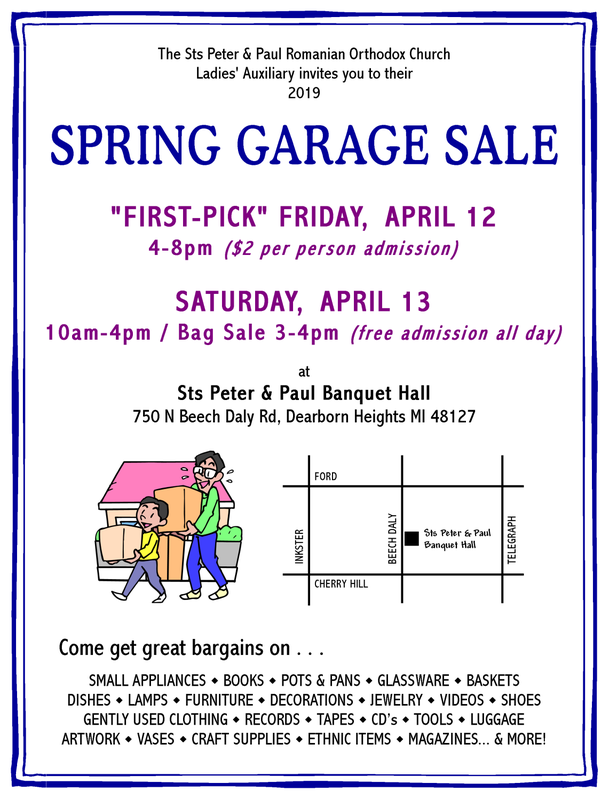 If you have items to clean out of your home and would like to donate them to the sale, please bring them to the church hall Sunday-Wednesday (April 7-10) the week prior to the event. All proceeds will go to the Ladies Auxiliary for their continued good work in our parish and community.